China is proposing that key countries work on “parallel tracks” to address North Korea’s desire for a peace treaty and the international community’s concerns about Pyongyang’s nuclear program, Chinese Foreign Minister Wang Yi said last month. In comments at a March 8 press conference in Beijing, he said that “denuclearization is the firm goal of the international community, while replacing the armistice is a legitimate concern” of North Korea. The 1953 armistice established a cease-fire in the Korean War, which divided the peninsula, but the conflict never formally concluded with a peace treaty. Wang said that the issues of denuclearization and the peace treaty “can be negotiated in parallel, implemented in steps, and resolved with reference to each other” and that China is “open to any and all initiatives that can help bring the nuclear issue on the peninsula back to the negotiating table.” North Korea has frequently called for the conclusion of a peace treaty through statements in its state-run media. Wang delivered a similar message about the two-track approach in earlier joint remarks with U.S. Secretary of State John Kerry on Feb. 23 in Washington. Wang said China “hope[s] that, in the near future, there will be an opportunity emerging for the resumption of the peace talks, of the six-party talks.” Those talks, which sought the dismantling of Pyongyang’s nuclear weapons program, were held from 2003, when North Korea announced its withdrawal from the nuclear Nonproliferation Treaty, to 2009, when Pyongyang abandoned the talks. Wang acknowledged that “certain parties have different views” on his two-track proposal. He apparently was referring to the United States, which maintains that denuclearization is its first priority. At a March 3 press briefing, State Department spokesman John Kirby said that “nothing is going to change about [the U.S.] belief that first and foremost there has to be denuclearization.” Washington has not “ruled out the possibility that there could sort of be some sort of parallel process here. 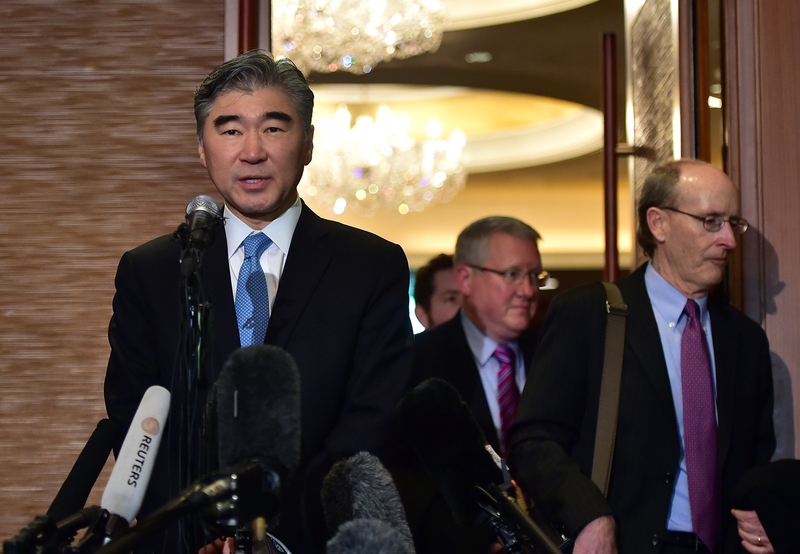 But—and this is not a small ‘but’—there has to be denuclearization on the peninsula and work through the six-party process to get there,” he said. The Wall Street Journal reported earlier this year that North Korea and the United States had been preparing for peace treaty negotiations via exchanges at the United Nations. In a Feb. 21 story, the paper reported that, in the days before Pyongyang conducted its fourth nuclear test, “the Obama administration secretly agreed to talks to try to formally end the Korean War, dropping a longstanding condition that Pyongyang first take steps to curtail its nuclear arsenal.” The subsequent nuclear test killed the diplomatic effort, the report said. Kirby rebutted some of the article’s key points in an email to Reuters the same day. He said that “it was the North Koreans who proposed discussing a peace treaty.” He stated that Washington “carefully considered” the proposal but insisted that “denuclearization had to be part of any such discussion.” Ultimately, North Korea rejected the U.S. response, he said. The U.S. response to the North Korean proposal “was consistent with our longstanding focus on denuclearization,” Kirby said.